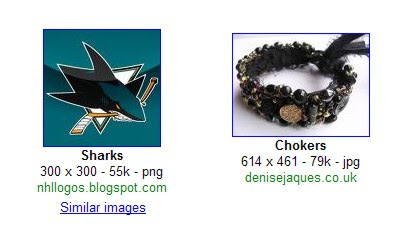 The big news in the web marketing world this week has been Google unveiling a cool new feature: Google Similar Images. 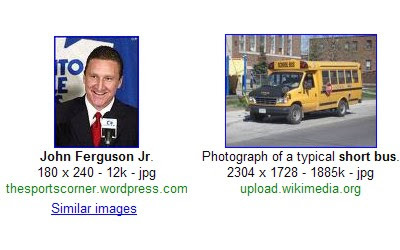 This new tool allows you to find an image that interests you, and then search for other images that are similar. Here's an example. 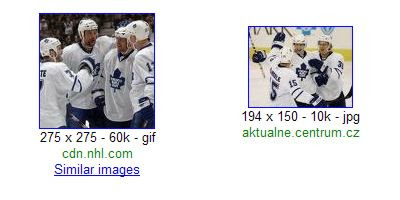 The image on the left is a shot of a Leafs goal that I found, and the image on the right is one that Google says is similar. Not bad, eh? 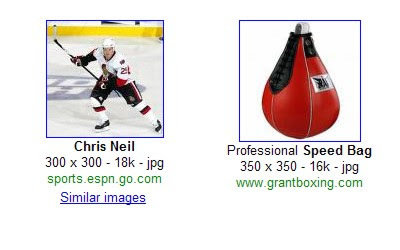 At first I assumed that Google was just relying on the image name and surrounding content, and maybe cross-referencing with some basic image attributes like orientation and maybe dominant color. Boy, was I wrong. After all, this is Google we're talking about. They're probably the smartest people in the world. 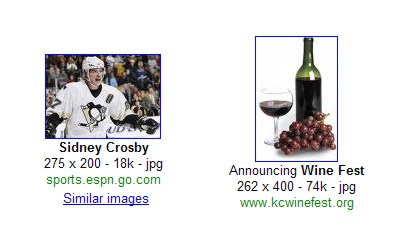 And this new image similarity search is scary good. Don't believe me? 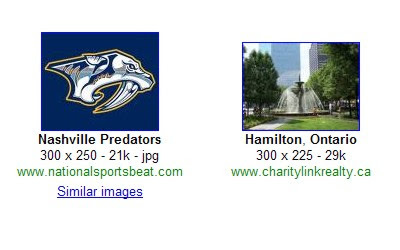 I spent some time randomly searching for hockey teams and players. 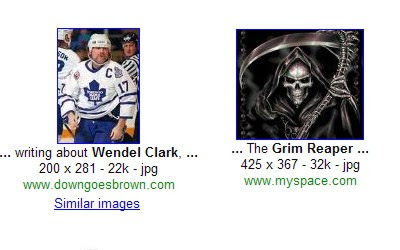 Check out some of the "similar" images Google came up with. 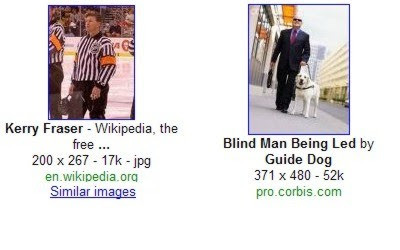 Lmaooooo the Jiri Tlusty one is classic!! There is absolutely no question in my mind that I'm going to have to steal this concept for the NBA. Well done, sir. lololololol!!!! HILARIOUS. I like the Avery one the best. Hilarious! 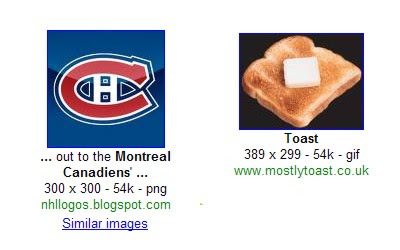 I think I like the Canadiens one the best. OMG! I laughed so hard my husband had to come check up on me. That was awesome. 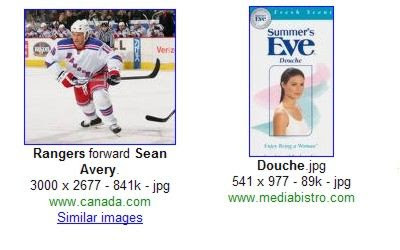 Especially the Sean Avery one... 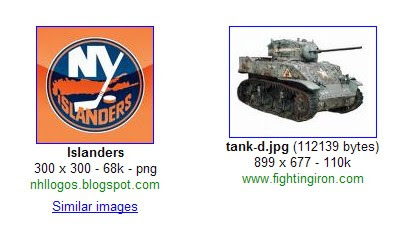 I could have done without the Islanders/Tank one... 'cause we didn't ATTEMPT to tank, but it was reasonable. You could seriously do these all night, couldn't you? Hahahahahaha........classic. You have got to make this a weekly series or somethin. That was hilarious. Didn't get the Toskala one though. Fine mesh sieve? Lol great post. welldone. Thanks I needed the laugh. I think it still has a few bugs to work out, though. I ran a picture of Kyle Wellwood and didn't get any blimps. It's a joke about how badly Toskala played this year. A sieve is a piece of kitchen equipment with lots of holes in it. 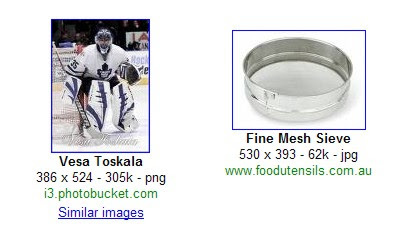 The one pictured is a fine mesh sieve, so it's holes are very small and... wait, crap, maybe it doesn't make sense. Dammit. I hope everyone recognized the enormous restraint involved in not doing a Kyle Wellwood joke here. You are a comic genius, DGB. Awesome. 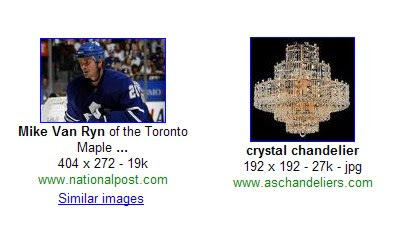 Pretty sure a Wellwood image would bring up an expensive creampuff. 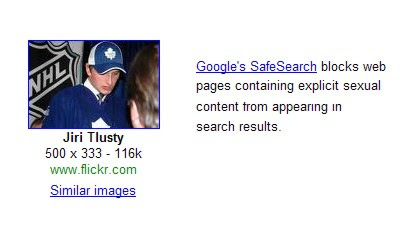 true story: just after Jiri Tlusty was drafted, I did a search on him to see what he looked like, more info, etc. After several pages into the search (safeseacrh off) I saw what I thought was a shirtless pic. It was a totally naked pic. Of a cover of a gay pron movie called "Czechers". Apparently it started tow guys named JIRI [last name] and [first name] TLUSTY. I'm upset there wasn't a Wellwood/Stay Puff Marshmallow man entry. There can never be enough Wellwood commentary. This is quickly becoming one of my favourite hockey blogs on the net! Geeat post! 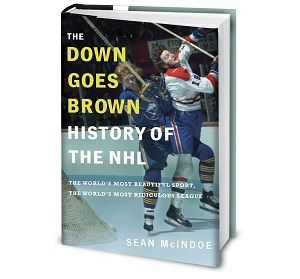 Down goes Sean Avery! Once again, this is brilliant. I really needed a good laugh today, after my dear habs were swept yesterday, so thank you very much, that was great! Super funny! The toast pic was classic. If you worked where I worked you'd probably snap. 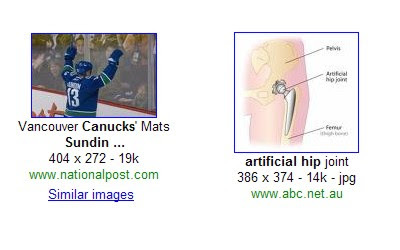 I am glad I found your blog through puckdaddy, I love it when blogs link to stuff that is 10x better than what they actually write!